Home / galaxy s9 / news / Samsung / Samsung Galaxy / Samsung Galaxy S9 / tech / tech news / Samsung Galaxy S9: first official photo? Samsung Galaxy S9: first official photo? The journalist Evan Blass has just published the photos of the Samsung Galaxy S9 and Galaxy S9 +. The aesthetic evolutions would be minor. 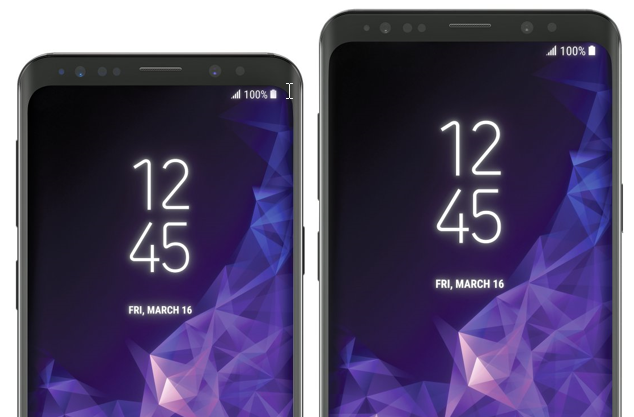 It's now a ritual, the journalist Evan Blass has just killed some of the suspense by publishing what looks like official images of the Samsung Galaxy S9 and S9 +. Clichés that have a good chance of being authentic. Used to pull his information closer to the agencies working with manufacturers, he had already revealed the images of the Samsung Galaxy S8 and Samsung Galaxy S7, a few weeks before their respective presentations. The images confirm the previous rumors, namely a design very similar to that of the Samsung Galaxy S8. The brand is expected to maintain its Super Amoled Infinity Display at 18: 9, with thin horizontal stripes at the top and bottom of the device. The photo published by Evan Blass allows to see many sensors on the front. The iris recognition function should be retained and the facial recognition function improved, to better get closer to Face ID. The reports also provide information about the South Korean calendar. The date of Friday, March 16 is on the screen, probably evoking the arrival on the market. A consistent information, knowing that the Galaxy S9 will be presented on February 25 by Samsung. For the moment, no cliché of the back part has been published. An image that could confirm the presence of the dual camera module on the Samsung Galaxy S9 +, and its absence on the Galaxy S9.